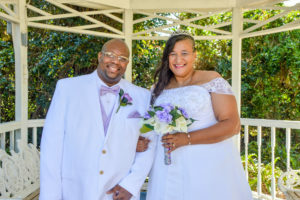 Tamela Levette Davis, originally of Augusta, GA, the daughter of Andrell and Deborah Kemp and Edward Davis, originally from Augusta, GA, the son of Earl and Laura Davis renewed their vows on Saturday, October 29, 2016 in the chapel at Wedding Chapel by the Sea in Myrtle Beach, South Carolina. Rev. Pam Muise officiated. The couple will honeymoon in Wilmington, SC before returning to North Augusta, GA where they will reside.